During an archaeological dig with SG-11 on P3X-888, Daniel Jackson and his associate Robert Rothman discover the remains of an ancient predatory Goa'uld symbiote. The planet is the original home world of the primordial Goa'uld and the aboriginal Unas race they eventually took as hosts. Suddenly, an Unas enters the dig site and attacks the team, capturing Daniel and dragging him deep into the wilderness. Rothman brings word back to the SGC, and O'Neill heads a joint rescue mission to the planet. The rescue team arrives to find that only Major Hawkins of SG-11 has survived, and the primitive Unas are not the planet's only threat. The rivers are teeming with Goa'uld symbiotes, and the team fears that any one of them could have been secretly taken as a Goa'uld host. Unknown to them, their fears are justified, and in fact two of them have already been victims of the Goa'uld. Both Hawkins and Rothman have unwittingly become hosts, and both are killed when they turn against the other team members. Meanwhile, Daniel is dragged further into the wilderness. As he struggles to communicate with his captor in the creature's primitive language, he comes to understand that the young Unas, named Chaka, has captured him as part of a right of passage. Slowly they begin to form the bonds of understanding and trust as Daniel tries to negotiate for his freedom. 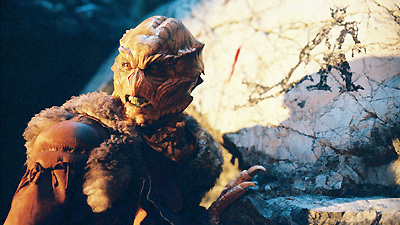 When the rescue team finally reaches Daniel, they witness a confrontation between Chaka and the Unas leader, a battle in which Chaka protects Daniel, and finally allows him to go free. Daniel joined SG-11 for an archaeological survey of P3X-888. He theorized that this was the planet from which the primordial Goa'uld originated, that they were predators rather than parasites, and that they evolved for millions of years in the prehistoric oceans before taking on hosts. Those who took on hosts learned to use the stargate and left the planet. The aboriginal Unas who stayed behind took refuge in the caves for protection against blending. No traces of naquadah were found in the Goa'uld fossils, suggesting that it became part of their makeup later in their evolution. Members of SG-11 archaeological team: Major Hawkins (taken as a host and killed), Loder (killed by the Unas), Sanchez (killed), Robert Rothman (taken as a host and killed). Members of SG-2 joining SG-1 for search and rescue: Major Coburn, Captain Griff, Pierce. The Unas have green blood. The blood of the Goa'uld is blue. Symbiotes can't blend with a Jaffa. Calling to the UAV: A keka! Shesh! Cha a'ka keka! Responding to the cave drawings: Wok tah! Confronting the adult: Ka! Ka keka! Tak! Cha a'ka ska nat. Cha a'ka. Cho' ee' che! Cho Cha a'ka! Ka nan!